Robert Allen Palmer (19 January 1949 – 26 September 2003) was an English singer-songwriter, musician, and record producer. He was known for combining soul, jazz, rock, pop, reggae, and blues. Palmer's involvement in the music industry began in the 1960s, covered four decades and included a spell with the band Vinegar Joe. He found success both in his solo career and with the Power Station, and had Top 10 songs in both the United Kingdom and the United States in the 1980s. Two of his hit singles, "Addicted to Love" and “Simply Irresistible”, were accompanied with stylish music videos directed by British fashion photographer Terence Donovan. Palmer received a number of awards throughout his career, including two Grammy Awards for Best Male Rock Vocal Performance, an MTV Video Music Award, and two Brit Award nominations for Best British Male Solo Artist. Palmer died aged 54 following a heart attack on 26 September 2003. Palmer's father was a British naval intelligence officer stationed in Malta. In 1949, Palmer moved with his family from Batley, where he was born, to Scarborough. Influenced as a child by blues, soul and jazz music on American Forces Radio, Robert Palmer joined his first band, The Mandrakes, at the age of 15 whilst still at Scarborough High School for Boys. His first major break came with the departure of singer Jess Roden from the band The Alan Bown Set in 1969, after which Palmer was invited to London to sing on their single "Gypsy Girl". The vocals for the album The Alan Bown Set!, originally recorded by Roden (and released in the US that way), were re-recorded by Palmer after the success of the single. According to music journalist Paul Lester, Palmer rose from northern clubs in England to become "elegant and sophisticated" and the master of several styles. In 1970 Palmer joined the 12-piece jazz-rock fusion band Dada, which featured singer Elkie Brooks and her husband Pete Gage. After a year, Palmer, Brooks and Gage formed soul/rock band Vinegar Joe. Palmer played rhythm guitar in the band, and shared lead vocals with Brooks. Signed to the Island Records label, they released three albums: Vinegar Joe (1972), Rock 'n' Roll Gypsies (1972) and Six Star General (1973), before disbanding in March 1974. Brooks later said that Palmer "was a very good-looking guy", and that female fans were happy to find that Brooks and Palmer were not romantically linked. Island Records signed Palmer to a solo deal in 1974. His first solo album Sneakin' Sally Through the Alley recorded in New Orleans, Louisiana, in 1974, was heavily influenced by the music of Little Feat and the funk fusion of the Meters who acted as backing band along with producer/guitarist Lowell George of Little Feat. Although unsuccessful in the UK, both the album and single reached the Top 100 in the US. Notably, "Sailin' Shoes" (the album's first track, and a Little Feat cover), Palmer's own "Hey Julia" and the Allen Toussaint-penned title track carry virtually the same rhythm, and were packaged on the album as a "trilogy" without a pause between them. After relocating with his wife to New York City, Palmer released Pressure Drop, named for the cover version of the reggae hit by Toots and the Maytals, in November 1975 (featuring Motown bassist James Jamerson). He toured with Little Feat to promote the reggae- and rock-infused album. With the failure of follow-up album Some People Can Do What They Like, however, Palmer decided to move to Nassau, Bahamas, directly across the street from Compass Point Studios. In 1978, he released Double Fun, a collection of Caribbean-influenced rock, including a cover of "You Really Got Me". The album reached the Top 50 on the US Billboard chart and scored a Top 20 single with the Andy Fraser-penned "Every Kinda People". The song has been covered by other artists including Chaka Demus and Pliers, Randy Crawford and Amy Grant. It reached number 16 on the Billboard Hot 100. Palmer's next album was an artistic departure, concentrating on pure rock. 1979's Secrets produced his second Top 20 single with Moon Martin's "Bad Case of Loving You (Doctor, Doctor)". The number 14 hit also gave Palmer his second Billboard Hot 100 year-end chart hit. The 1980s saw Palmer find an increasing amount of commercial success. The album Clues, produced by Palmer and featuring Chris Frantz and Gary Numan, generated hits on both sides of the Atlantic, first with the radio-friendly single "Johnny and Mary" and then "Looking for Clues". Catchy music videos matching the synth-pop stylings of new wave gave him much needed exposure to a younger audience. The success was repeated with the 1982 EP release of Some Guys Have All the Luck. In April 1983 Pride was released, which, while not as commercially successful as Clues, did feature the title song and Palmer's cover of The System's "You Are in My System", with The System's David Frank contributing keyboard tracks to the latter song. On 31 May 1983, Palmer's concert at the Hammersmith Palais was recorded and broadcast on BBC Radio 1. On 23 July 1983, Palmer performed at Duran Duran's charity concert at Aston Villa football ground, where he struck up friendships with members of Duran Duran that would spawn the supergroup the Power Station. When Duran Duran went on hiatus, guitarist Andy Taylor and bassist John Taylor joined former Chic drummer Tony Thompson and Palmer to form the Power Station. Their eponymous album, recorded mainly at the New York recording studio for which the band was named, with overdubs and mixing at Compass Point Studios in Nassau, Bahamas, reached the Top 20 in the UK and the Top 10 in the US. It spawned two hit singles with "Some Like It Hot" (US number 6) and a cover of the T. Rex song "Get It On (Bang a Gong)", which peaked one position higher than the original at US number 9. Palmer performed live with the band only once that year, on Saturday Night Live. The band toured, and played Live Aid, with singer Michael Des Barres after Palmer bowed out at the last moment to go back into the recording studio to further his solo career. With Palmer bailing on the tour, some critics referred to it as "unprofessional behaviour". In Number One magazine, he hit back at the claims he joined the band for money: "Firstly, I didn't need the money, and secondly the cash wasn't exactly a long time coming. It wasn't exactly an experience that set me up for retirement." He also was accused of ripping off the Power Station sound for his own records. He snapped: "Listen, I gave the Power Station that sound. They took it from me, not the other way around." Palmer recorded the album Riptide at Compass Point Studios in 1985, recruiting Thompson and Andy Taylor to play on some tracks plus Power Station record producer Bernard Edwards, who worked with Thompson in Chic, to helm the production. Riptide featured the US number 1 and UK number 5 single "Addicted to Love". "Addicted to Love" reached number 1 in the United States. The single was accompanied by a memorable and much-imitated music video, directed by Terence Donovan, in which Palmer is surrounded by a bevy of near-identically clad, heavily made-up female models simulating "musicians". Donovan also directed videos for the hits "Simply Irresistible" and "I Didn't Mean to Turn You On". In September 1986, Palmer performed "Addicted to Love" at the 1986 MTV Video Music Awards in Los Angeles. In 1987, he won the Grammy Award for Best Male Rock Vocal Performance for "Addicted to Love". At the 1987 Brit Awards, Palmer received his first nomination for Best British Male. Another single from Riptide, his cover of Cherrelle's "I Didn't Mean to Turn You On", also performed well (US number 2, UK number 9). Another song, "Trick Bag", was written by one of his major influences, New Orleans jazz artist Earl King. Concerned about the rising crime rate in Nassau, Palmer moved to Lugano, Switzerland in 1987 and set up his own recording studio. Producing Heavy Nova in 1988, Palmer again returned to experimenting, this time with bossa nova rhythms, heavy rock and white-soul balladeering. He repeated his previous success of "Addicted to Love" with the video of "Simply Irresistible", again with a troupe of female "musicians". The song reached number 2 in the US and was Palmer's final Top Ten hit there. The ballad "She Makes My Day" also proved to be a hit in the UK, peaking at number 6. In 1989, he won a second Grammy for "Simply Irresistible", which would later be featured in the Tony Award-winning musical Contact. At the 1989 Brit Awards, Palmer received his second nomination for Best British Male, and "Simply Irresistible" was nominated for Best British Single. Rolling Stone magazine voted Palmer the best-dressed rock star for 1990. Palmer expanded his range even further for his next album, Don't Explain (1990). It featured two UK top 10 hits with covers of Bob Dylan's "I'll Be Your Baby Tonight" (a collaboration with UB40) and Marvin Gaye's "Mercy Mercy Me". Throughout the 1990s, Palmer ventured further into diverse material. The 1992 album Ridin' High was a tribute to the Tin Pan Alley era. In 1994, Palmer released Honey to mixed reviews. While the album failed to produce any hit singles in the US, he did find success in the UK with the release of three modest hit singles "Girl U Want", "Know by Now" and "You Blow Me Away". In 1995, Palmer released a greatest hits album, which reached number 4 in the UK. In 1995 he reunited with other members of Power Station to record a second album. Bassist John Taylor eventually backed out of the project, to be replaced by Bernard Edwards. Palmer and the rest of the band completed the album Living in Fear (1996), and had just begun touring when Edwards died from pneumonia. In 1997, Palmer performed with Rod Stewart at Wembley. Palmer met his future wife Sue at Slough railway station in 1968, attracted by her style (silver-coloured boots and a matching mini-dress) and by the science-fiction book she was reading. They married two years later, and had two children, Jim and Jane. The family moved to New York in the mid-1970s and then to the Bahamas a few years later. In 1993, Palmer relocated to Lugano, Switzerland, after he found that the islands were unsafe because of drugs and gun violence. He divorced the same year. Palmer was a heavy smoker. Palmer died from a heart attack in a Paris hotel room on 26 September 2003 at age 54. He had been in the French capital after recording a television appearance in London for Yorkshire TV, a retrospective titled My Kinda People. He was survived by his parents, his son and daughter, his brother Mark, and his girlfriend Mary Ambrose. Among those who paid tribute were Duran Duran, stating: "He was a very dear friend and a great artist. This is a tragic loss to the British music industry." ^ a b c Roberts, David (2006). British Hit Singles & Albums (19th ed.). London: Guinness World Records Limited. pp. 415–416. ISBN 1-904994-10-5. ^ a b c d e f Roberts, David (1998). Guinness Rockopedia (1st ed.). London: Guinness Publishing Ltd. p. 307. ISBN 0-85112-072-5. ^ "Addicted to Love: fashion's favourite video for 30 years". The Guardian. Retrieved 22 March 2019. ^ a b c d e f g h i j k l m n o p q r s Strong, Martin C. (2014). The Great Rock Discography (5th ed.). Edinburgh: Mojo Books. pp. 2–3. ISBN 1-84195-017-3. ^ Tobler, John (1992). NME Rock 'N' Roll Years (1st ed.). London: Reed International Books Ltd. p. 262. CN 5585. ^ "Elkie Brooks Remembers Singing With Robert Palmer - Robert Palmer : Music & Style". Robert-palmer.over-blog.com. Retrieved 16 July 2018. ^ Lewis, Randy (9 January 2014). "Billboard Shakeup puts Hollywood Reporter's Janice Min in Charge". Los Angeles Times. Retrieved 13 January 2014. ^ a b Number One magazine, circa 1986: "Bob's Your Uncle" by Pat Thomas, pp 28–29. ^ "Robert Palmer". Billboard. Retrieved 27 February 2019. ^ Tobler, John (1992). NME Rock 'N' Roll Years (1st ed.). London: Reed International Books Ltd. p. 453. CN 5585. ^ Kovats, Tom. "Rod Stewart Robert Palmer Some Boys Have All The Luck Live Songs & Visions Concert Wembley 1997". Retrieved 28 December 2017. ^ "Music: Some guys have all the luck". Independent.co.uk. Retrieved 16 July 2018. 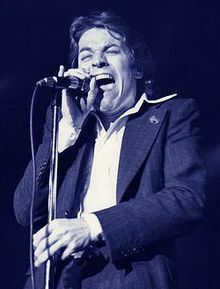 ^ a b "Obituaries: Robert Palmer". The Daily Telegraph. 27 September 2003. Retrieved 19 December 2013. ^ Parales, Jon (27 September 2003). "Robert Palmer, Singer With Image of a Pop Romeo, Dies at 54". The New York Times. Retrieved 19 December 2013. Wikimedia Commons has media related to Robert Palmer.